We have been operating a website and customer self-service portal for many years now. In an effort to make these tools easier to use and more beneficial to customers, we are upgrading our customer-self-service portal to be an easy-to use, intuitive tool that will help you run your business more efficiently. The customer portal is a private, secure site that enables you to pull account specific information on your orders, invoices, credit status and more. It provides complete 24/7 access to up-to-date information, containing everything that you need in one place. We are confident the new improved solution to help our customers navigate their accounts and find content that is relevant with ease and simplicity. 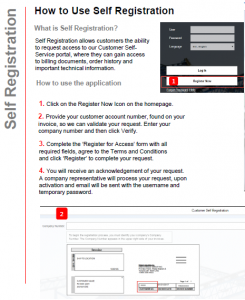 Customers are invited to register for an account today by clicking the link below to access the portal. Please note that customers who have an account on our existing portals will need to re-register on the new portal as previous usernames and passwords will not work. Click here to access the new customer self-service portal!